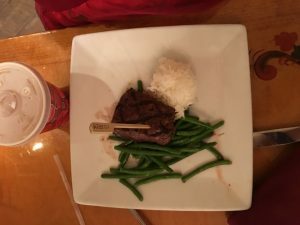 Just like at Chef Mickey’s, we were encouraged to review the buffet to point out items safe for our food allergies, and again we told the chef it wasn’t worth the risk of cross-contamination. So the chef brought out waffles (bit of a bummer that they were Vans and not Mickey waffles, but oh well), fruit, granola, and bacon. My husband and I liked the Norwegian fish options here. The only thing I didn’t like at this restaurant was that the table was so small it was hard to fit our family style platter on it that was full of the foods my daughter was allergic to. I probably would avoid breakfast here again because of that. 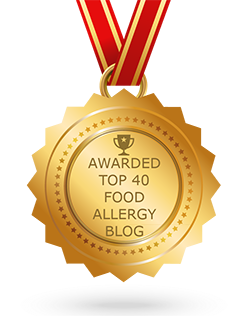 If you would like to review Akershus or any Disney restaurant, submit a food allergy dining Quick Review. This quick review was provided by Carrie, whose sister-in-law is allergic to dairy, eggs, pork and corn. We went for the princess breakfast. It was so good and Chef Jerry was awesome! After we were seated Chef Jerry came out to talk to my sister-in-law who just found out she had these allergies. He walked her through the buffet and told her what she could and could not have. She figured she would be just eating fruit. Boy was she surprised when he came out with waffles with dairy free butter and he called over to Morocco to get her some turkey sausage! He was great! That was the first time in about a month my sister-in-law was able to actually eat out at a restaurant. She was in heaven! Chef Jerry was very good and attentive. I would recommend this to anyone with allergies, hands down! 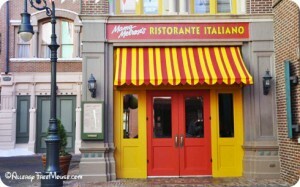 If you would like to review Akershus Royal Banquet or any Disney restaurant, submit a food allergy dining Quick Review. 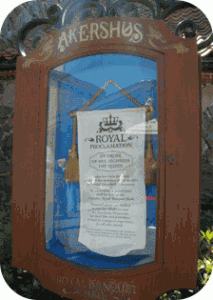 Located in the Norway Pavilion in Epcot, Akershus Royal Banquet Hall provides a true Disney Storybook Dining experience. Like Cinderella’s Royal Table, the setting is medieval and there are plenty of Disney Princesses roaming around, signing autographs and posing for pictures. 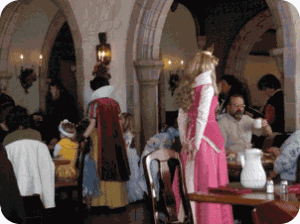 The difference is that it is much more relaxed and the Princesses spend more time at your table. Price range: $15.99 – 35.99. Enjoy breakfast, lunch and dinner in a Norwegian castle. 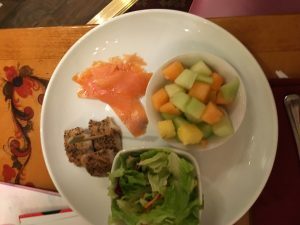 The breakfast is served family style and contains more American fare, while lunch and dinner are more authentically Norwegian. We prefer the breakfast, complete with a potato dish that is part casserole and part home fry. It’s truly delicious. The meal also includes bacon, sausage, scrambled eggs, fruit, biscuits and pastries. Lunch entrees include a salmon burger, open-faced chicken sandwich, Kjottkake (Norwegian meatballs), venison sausage sandwich, mushroom-stuffed pasta and oven-roasted chicken breast. Dinner includes pan-seared salmon, oven-roasted chicken, Kjottkake, mushroom-stuffed pasta, pork tenderloin, seared herb-dusted beef tips and the chef’s catch-of-the-day. Kids entrees include grilled chicken breast, cheese ravioli, pizza and hot dogs. When we arrived, we discussed our daughter’s dairy allergy with the hostess. 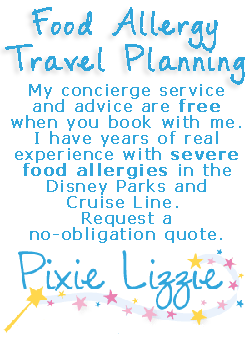 The hostess informed the server of our daughter’s allergy, and we confirmed it with her. After meeting with the chef, he prepared our daughter scrambled eggs, bacon, dairy-free waffles, and fresh fruit. The meal was wonderfully prepared and completely dairy-free. 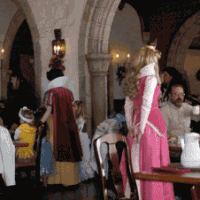 The Disney Princess visits are much more relaxed at this Character Dining event. They make their rounds, visiting each table in turn, signing autographs and talking with the kids. They will allow you plenty of time to take photographs and videos, making sure you get a good shot. There is no guarantee of the Princess line-up, though it’s highly unlikely that Cinderella will be there. Belle is the first Princess you meet. As you enter, you’re allowed to pose with her for personal and PhotoPass pictures, plus an autograph. The rest of the Princess encounters may include Snow White, Sleeping Beauty, Ariel, Jasmine and Mulan. 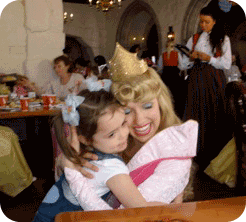 It’s an over-all, fabulous experience for the Princess meetings, food and especially the allergy-free food preparation.